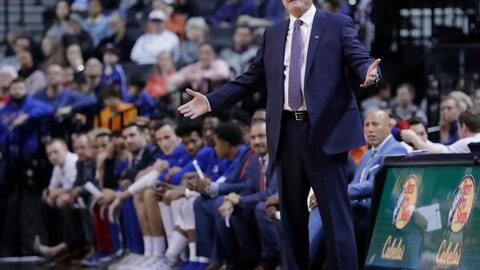 NEW YORK (AP) — Top five teams Kansas and Tennessee were tested in the NIT Season Tip-Off semifinals. Both passed and will face off in the championship game Friday night. In the first semifinal, Grant Williams scored 24 points and the Vols had five players in double figures to beat the Cardinals. Admiral Schofield added 20 points for the Vols (4-0), who shot 54 percent from the field. The win was the 664th of Tennessee coach Rick Barnes’ career. It moved him past John Wooden on the all-time Division I wins list. “It means I’ve been around a while,” Barnes said. Trailing 77-70 with 6:51 left, Louisville coach Chris Mack got called for a technical foul when he didn’t like an over-the-back call on Dwayne Sutton. The Cardinals could never recover, trailing by as many as 15. Jordan Nwora had 23 points and 10 assists to lead Louisville (3-1). While Kansas could vault itself into the No. 1 ranking with a win after No. 1 Duke’s loss to No. 3 Gonzaga, Self sees it as litmus test for a team ripe with underclassmen.